Reading List - Firefox Addon - Press the "Read Later" button in the site menu to save the current page. Later you can browse through the list of saved pages, and open them in a special text-only view that is available even offline. You can also return to view the page on the original site. Read Later is inspired by Instapaper and uses code from arc90's Readability. · New Swedish localization by Mikael Hiort af Ornas. 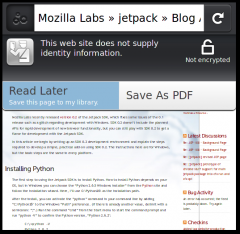 · Fixes a bug that prevented the add-on from working in Firefox 10. · Version 1.2.5 updates some icons to fit in slightly better with the new theme in mobile Firefox 4.0. · This version improves Reading List's appearance when used with the new theme in Firefox 4 beta 2 for mobile.